Few Questions every Indian wants. Home Minister Shivraj Patil resigns. 183 dead in Mumbai terror attack Why did NSG take 9 hrs to get there? The terrorists arrived at Mumbai by boat and began fanning out through the city, firing automatic weapons indiscriminately. The terrorists struck at luxury hotels, a railroad station, a popular restaurant, and a hospital. 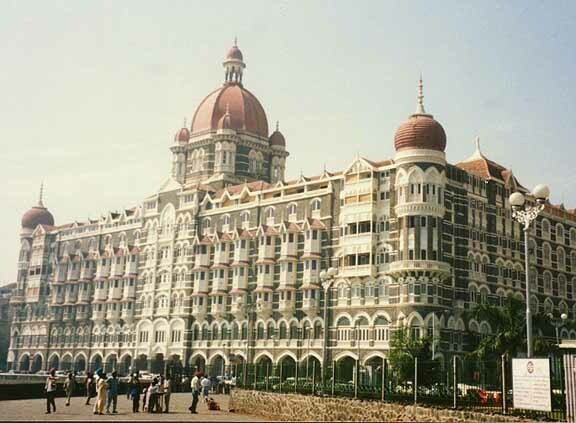 The terrorists took hostages at two Mumbai luxury hotels, the Taj Mumbai Terrorist Attacks by "Deccan Mujahedeen" Mahal and the Trident-Oberoi as well as the Chabad-Lubavitch center, a Jewish community center frequented by Israeli tourists. The Islamic terrorists, calling themselves the Deccan Mujahedeen, apparently targeted American and British tourists, demanding to see passports, and then either shooting the tourists or taking them hostage. Israelis were also among the hostages. 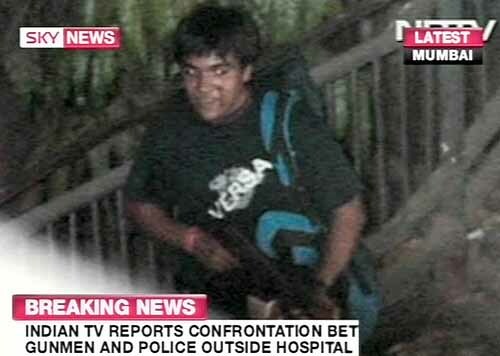 The Islamic terrorists are described as "South Asian" in their early twenties and may have ties of Al Qaeda, though that is disputed by some terrorism experts. 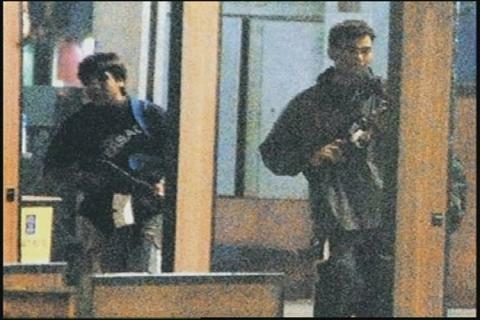 Indian security forces have freed numerous hostages from the Taj Mahal hotel and are as of this writing battling terrorists in the Taj Mahal and Trident-Oberoi hotels. Explosions and gun fire have been heard throughout the night and early morning in Mumbai. India has had trouble with Islamic terrorists due to the dispute with neighboring Pakistan over the region of Kashmir, over which the two countries have fought two wars. India is also a close ally with the United States in the War on Terror and is increasingly making its influence felt on the world. India's navy is helping to fight Somali pirates off the Horn of Africa. 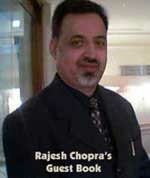 India has become a center of high tech commercial enterprises. India even has a space program, having recently placed a robotic probe in orbit around the Moon. Mumbai is the financial capital of India and thus makes a choice target for Islamic terrorists trying to make publicity with mass casualty attacks. The so-called "Deccan Mujahedeen" may be a group comprised of members of two other terrorist groups, the Indian ujahideen and Mumbai Terrorist Attacks by "Deccan Mujahedeen" the Lashkar-E-Taiba. The Indian Mujahideen is an offshoot of the Students' Islamic Movement of India (SIMI), a home grown group that seems to have gotten backing from Pakistan. Lashkar-E-Taiba is based in Pakistan, has been fighting for home rule in Kashmir, and has ties to Al Qaeda. Besides the casualties and destruction wrought by the terrorist attacks in Mumbai, the possible involvement of Pakistan is most disquieting about the incident. Pakistan is nominally also an American ally in the War on Terror. 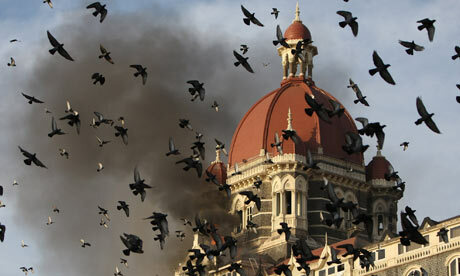 If it is proven that Pakistan had some involvement in the Mumbai attacks, conflict could erupt between the old enemies of India and Pakistan. Both countries, by the way, have nuclear weapons. Conflict between India and Pakistan, even if it does not erupt into full scale war, would complicate efforts to suppress the Islamic terrorist insurgency in Afghanistan and to deal with terrorists based in the neighboring Pakistani area of Waziristan. The situation developing in South Asia appears to be yet another "test" that Joe Biden predicted would come for President Elect Barack Obama. The terror attack in Mumbai shoukd make Obama think long and hard about campaign promises concerning closing Gitmo, watering down the Patriot Act, and anything else that might be seen as dialing back on the War on Terror. In this photo composite of five of the nine suspected Islamic militants killed during last month's attack on Mumbai are shown in a release by Indian police in Mumbai, India, today. Police have identified the militants as clockwise from top left, Bada Abdul Rahman, Abdul Rehaman Chota, Babar Imaran alias Abu Akasha, Nasir alias Abu Umar, and Isamal Khan. Photos of the other suspects are not included because their bodies are too badly burned. 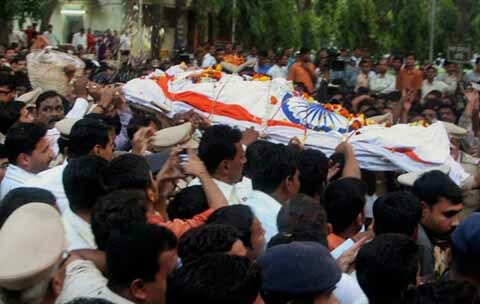 Thousands of people poured on to the streets to bid a tearful adieu to two bravehearts ~ Major Sandeep Unnikrishnan (above) and ATS chief Hemant Karkare (left) ~ who sacrificed their lives while taking on the terrorists in Mumbai. 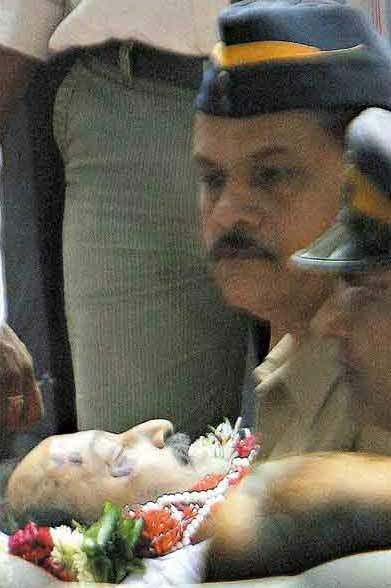 Citizens crowded the pavements and roofs and perched on trees to get a last glimpse as Karkare`s mortal remains were taken to Dadar to be cremated with full state honours. In Bangalore, friends, colleagues, family and fellow residents of the city filed past the mortal remains of 31-year-old Unnikrishnan with bent heads and folded hands. 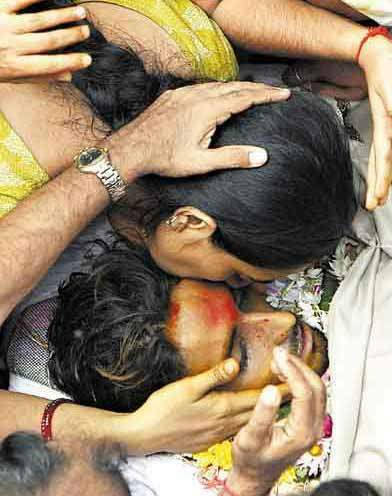 Unnikrishnan`s inconsolable mother sat close to his body caressing his forehead. said, adding he saw 12 to 15 dead bodies in a single room at the luxury premises. 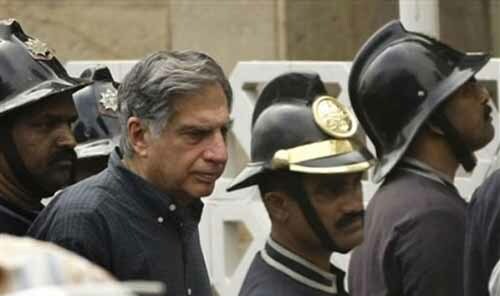 Giving an account of the commando raid at the besieged Taj, the leader of Indian Navy's elite Marine Commandos (MARCOS) today said his team saw about 50 dead bodies scattered through the hotel during the flush out operation. 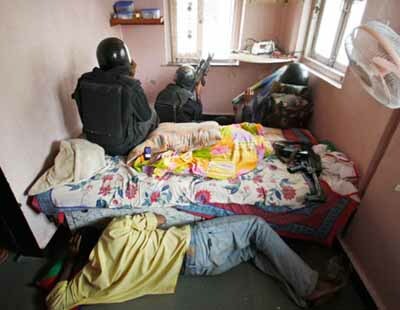 "12 to 15 dead bodies" were seen in one single room, he said. "They were the kind of people with no remorse — anybody and whomsoever came in front of them they fired," the unidentified masked commando whose face was disguised in a black scarf and sunglasses said. 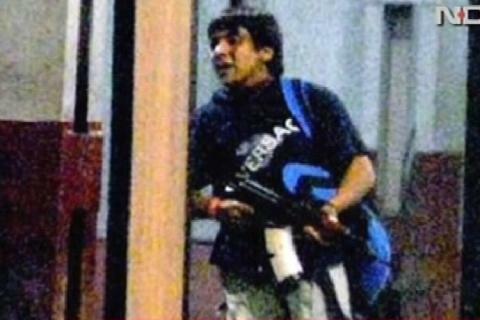 The account by the commando, who battled terrorists room-to-room in the hotel, was the first of the fighting to be given by a member of the elite operations unit since their operations began in the early hours of Thursday. A Mauritius national's identity card was recovered from the rucksack of a terrorist who escaped from a hotel room, he said, adding the recovered rucksack also contained Chinese made hand grenades, seven ammunition magazines, 400 spare rounds of ammunition, seven credit cards of different banks, dry rations and USD 1,200 and Rs 6,840. He said the commandos had been hampered by not knowing the layout of the 400 rooms in the hotel and that the exchanges of fire had taken place in darkness. But, he said the terrorists who were hurling grenades and firing from different floors and could not be seen because of the darkness and were "operating with ease." India's foreign minister ratcheted up the accusations over the attacks. "According to preliminary information, some elements in Pakistan are responsible for Mumbai terror attacks," Pranab Mukherjee said. Earlier Pakistan's Defence Minister Ahmed Mukhtar denied involvement by his country: "I will say in very categoric terms that Pakistan is not involved in these gory incidents." 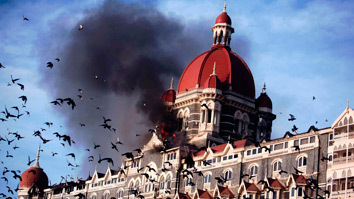 Oberoi hotel MUMBAI Indicating that the terrorists had done a recce of the targeted landmarks before their attack, the MARCOS leader said it was because of their knowledge of the building that the terrorists were able to strike at will. The commando said the assault team had noticed only three to four terrorists, who were probably operating from different floors, as they were very well versed with the topography of the Taj hotel, where they were holed up for nearly 40 hours. He said the commandos could have got the terrorists but for the presence of many guests. "The bodies were lying strewn here and there. There was blood all over and in trying to avoid the casualty of those civilians, we had to be that much more careful," he said. The guerrillas would have needed training to fire the weapons they used, he said, adding "Definitely it appears not everybody can fire the AK series of weapons." AK-47 rifles were among the weapons used by the terrorists. Describing the physique of terrorists, the MARCOS leader said they were not of a "big built" and were below thirty years of age. "They were wearing T-shirts and looked to be below 30 years and were of normal built," he said. The MARCOS leader said the team faced a problem in dealing with the terrorists inside the hotel as they did not know much about the building and had to take the help of the hotel staff to operate there. "We had to find our way out as we did not know the layout of Taj. The hotel staff helped us to find our way inside there," he said. The team could not even get access to the CCTV monitoring room that could have helped it in finding the exact location of the terrorists. "When we tried to enter the CCTV room, it was full of smoke and entering it was not possible and terrorists were also continuing with their fire," the team leader said. The MARCOS leader said terrorists were taking advantage of the darkness inside the hotel and continued firing whereas they had to move ahead with caution to avoid civilian casualties inside there. "They were firing all over and people were getting killed. We were also firing back at them but we had to be careful as civilian casualties are to be avoided," he added. 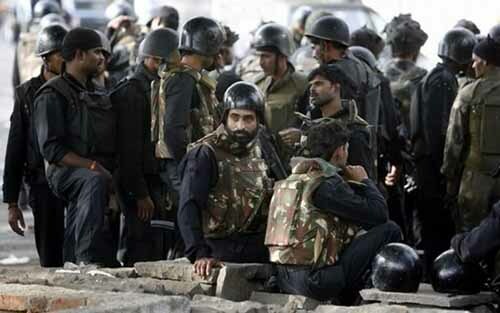 Indian forces claimed they would soon have Mumbai under full control after nearly two days of chaos and confusion that followed the terrorist attacks there. Commandos ended a siege of the luxury Oberoi hotel while other forces descended from helicopters to storm a besieged Jewish centre. After a chain of shootings across India's financial centre left at least 143 people dead and the city in panic General N. Thamburaj declared: "It's just a matter of a few hours that we'll be able to wrap up things." Explosions and gunfire continued intermittently at the elegant Taj Mahal hotel, but officials said commandos had killed two gunmen inside the nearby Oberoi and ended the attack there. 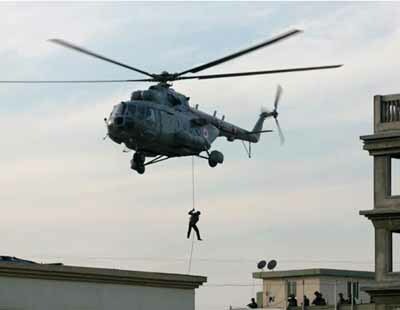 "The hotel is under our control," J.K. Dutt, director general of India's elite National Security Guard commando unit said, adding that 24 bodies had been found. 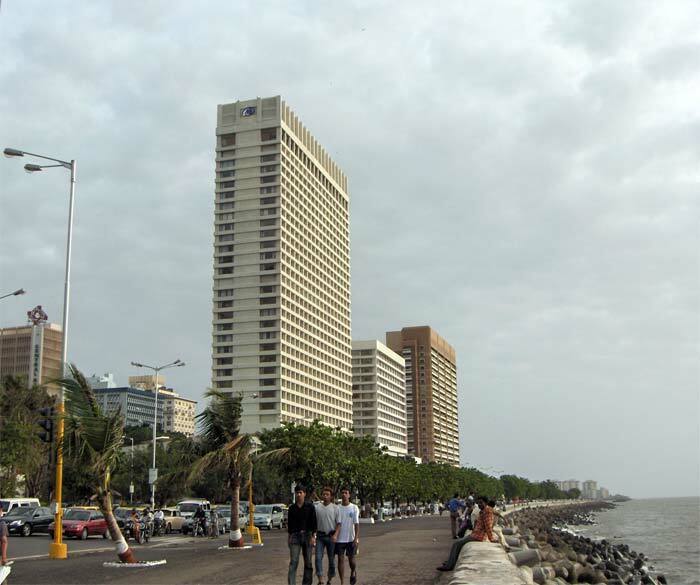 Dozens of people - including a man clutching a baby - had been evacuated from Oberoi earlier. The airborne assault on the centre run by the ultra-orthodox Jewish outreach group Chabad Lubavitch was punctuated by gunshots and explosions as forces cleared it floor by floor.The commandos initially had control of the top two floors. It was not immediately clear if there were hostages inside or their fate. Prime Minister Manmohan Singh blamed "external forces" for the violence - a phrase sometimes used to refer to Pakistani militants, whom Indian authorities often blame for attacks.